MANNY: How are you doing Gui? MANNY: Gui, what is your favorite flavor of ice cream? MANNY: We have two questions for this Q&A session. GUI: “I want to open a second Amazon account so that I can build up two similar brands, so I can sell one and keep the other. Should I do that or just keep it under one account?”. MANNY: That’s something I was pondering too for strategic purposes. Amazon does not allow that. They don’t want you to have two accounts to do that. If you want a second account, you can request an exception through Amazon, especially if you have two companies. My buddy just got approved for a second account – he is allowed to sell with both accounts but not in the same categories. GUI: They don’t want people monopolizing the search results. They don’t want one person taking over a whole search page. MANNY: I hope that answers that question! GUI: If we do not sufficiently answer questions, listeners can always ask us on our Facebook group. MANNY: It might be good to start a second company/account of you want to sell the first company after a certain time. MANNY: Of course you can run Pay Per Click ads right away. Is it a good idea? No, I don’t think so. Gui has an example. GUI: If you had to go to a town you have never been to before, you are hungry and you stop. You see at one side there’s a restaurant, the parking lot is full, there’s a line out the door and right across the street there’s another restaurant and there’s just one car in the parking lot. Which restaurant do you go to? Most people would wait in line because humans believe the masses may know something they don’t. If they don’t have personal knowledge on something, they tend to go with general consensus. They think the big group of people knows something they don’t know. The same principle applies with products. If you run Pay Per Click on a product that has no reviews, you’re going to pop up right on the first page next to those products that have taken the time to get those reviews. Your product is going to look like that empty restaurant. MANNY: You probably will get clicks because you’re right at the top, they’re going to click in and see you have no reviews. I have done that once, without reviews, it was a low competition market and the other person had very few reviews – I wanted to get going but there was almost now Pay Per Click on it anyways so I started doing that because there were just no way to get regular reviews on the product. Get friends or family to review the product for you, Google “review services”, build your own review group, whatever it takes… Get the first reviews within the first few days and you’ll be fine. GUI: Something that worries me is that he’s saying he doesn’t want the expenses. If you jump to private label, you have to have a cushion for getting reviews and running Pay Per Click. If you have to stretch your budget to get inventory, maybe you should try retail arbitrage. There’s going to be extra costs. MANNY: I always tell people to have a budget where you can give products away at a loss, at least 50 products, and out of those 50 products not everyone is going to leave you a review. You’re losing money on that initially. GUI: What would a sufficient cushion be? For example, spending $2000 on inventory, what costs must you set aside for the launch? How much would you allocate towards units and Pay Per Click? MANNY: It depends on your market. When you go into a low competitive market, you don’t need as much. If the competition is more and the competition sells a few hundred units a day, you’ve got to sit down and do the math. If you compete with these guys, I would say get at least 50 reviews to start with. Pay Per Click – it depends on how fast you want to get your product up on the organic ranking. Go back and listen to all the podcasts, from episode one. Learning is key! GUI: Manny, when you started you were not just learning; you were taking action on what you were learning. So many people fail because they’re just learning and never doing anything. MANNY: There’s a point where you’ve learnt enough to make it work, to take your first step. Never give up, it’s not always going to be a success. If you have any questions, leave us a question on the AM/PM site or on the Facebook group. Also follow me on Periscope. 01:50 – Manny: Gui, what is your favorite flavor of ice cream? 03:05 – First question: I want to open a second Amazon account so that I can build up two similar brands, so I can sell one and keep the other. Should I do that or just keep it under one account? 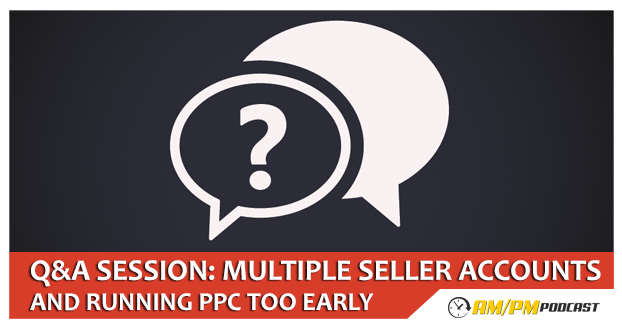 06:53 – Can I start running PPC ads right away before I have reviews? I don’t want to wait or have the expenses involved in getting reviews. 13:37 – What would a sufficient cushion be?